The thirteenth day of the month of Av marks the birthday, 101 years ago, of Menachem Begin. Begin was an extraordinary Jewish leader, one who devoted his life tirelessly to Am Yisroel and Eretz Yisroel. He was part of the founding generation of the modern State of Israel, and he later led Israel through tragedy and triumph. He kept his focus on the safety and security of the Jewish people, and he maintained an unapologetic view of the Jewish people’s biblical right to Eretz Yisroel. Menachem Begin was born to Ze’ev and Chasia Begin on August 16, 1913, the13th day of Av, in Brest-Litovsk, Belarus. Throughout his life, Menachem maintained a unique appreciation for Torah scholarship, especially Tanach and Biblical studies. This appreciation was cultivated in his hometown, a town that Begin always referred to as “Ir V’eim B’Yisroel, a city and mother in Israel. Begin’s family was close with Ariel Sharon’s family, who at that time were known as Scheinerman. It was Ariel Sharon’s grandmother who was the midwife that delivered Menachem Begin at his birth. Zionism offered a sense of purpose and community for many Jews of that time period, and the Begin family was no different. As a child, Menachem Begin’s father exposed his children to Zionist clubs, first with the Hashomer Hatzaier, and then later with Betar. Betar was the “revisionist” Zionism group led by Ze’ev Jabotinksy, which advocated a more militaristic approach to returning to the Land of Israel. Jabotinsky took Begin under his wing, and Jabotinsky’s tutelage in those early years shaped much of Begin’s worldview and outlook. In 1935, Begin graduated with a law degree from Warsaw University but he chose not to practice law, and instead devoted himself full time to Betar and the Zionist cause. His oratory skills and leadership qualities were quickly apparent, and he assumed the leadership of Betar Poland in 1938. In this role, he traveled throughout Europe, advocating Betar’s philosophy that the Jewish people were entitled to a homeland on both sides of the Jordan River, as promised by the Torah. During his travels, he met a young woman named Aliza, and they were married shortly before the outbreak of World War II. Menachem and Aliza would eventually have three children. With the German invasion of Poland in September 1939, Begin and his wife chose to relocate further east to Vilna, to escape the oncoming Nazi onslaught. However, the Begin family did not find much refuge in Vilna as Soviet forces soon invaded and occupied the region. Begin was well known for his Zionist ideals, and he soon aroused the ire of the NKVD while leading a commemoration ceremony for the birthday of Theodore Herzl. Towards the end of 1940, he was arrested by the Soviets and sent to Lukishki Prison for the crime of being a Zionist. Begin proudly “confessed” to this “crime”, and defiantly told his captors that Zionsim was not a crime, but rather an expression of the Biblical right of the Jewish people. Begin later authored a book about his experiences in the Soviet prison, titled White Nights. In May of 1942, the Soviets released thousands of Polish prisoners under an agreement reached with the Polish government in exile. Begin was among those freed prisoners, and he promptly joined the Polish Free Army to fight the Germans alongside the British. As Divine Providence would have it, Begin and his comrades were stationed in Eretz Yisroel, then known as Palestine, which was a part of the British Empire. Begin served in the Polish Army until December 1942, when he was discharged so that he could join the Irgun. Begin had achieved his lifelong dream of making aliyah to Eretz Yisroel, but the next few years would be among the most challenging of his life. 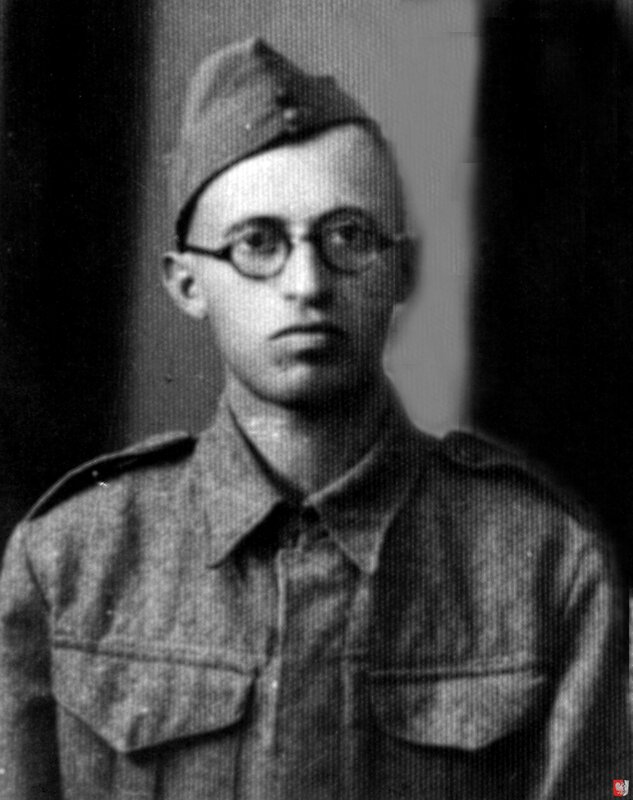 Begin joined the ranks of the Irgun, also known as Etzel (Irgun Tzvai Le’umi) upon his discharge from the Polish army in 1942. In those years, there were several factions in Eretz Yisroel representing the Olim and protecting the Jewish inhabitants from Arab attacks, the most dominant of which was the Haganah. Begin disagreed with the Haganah’s approach to Jewish matters and statehood, arguing that a stronger approach was needed to achieve this important goal. His previous experience leading Betar contributed to his philosophy that appeasing the British would not result in a Jewish state. Begin’s disagreement with the secular approach of the Haganah would resurface time and again throughout his life and political career. Begin assumed command of the Irgun in 1943. He broadcasted radio addresses calling on all Jews to stand up and resist the British, whom he believed were directly responsible for the tragic fate of European Jewry who were being murdered by the Nazi’s. By restricting immigration into Palestine, the British effectively sealed Eretz Yisroel from the outside world. This, Begin argued, was the greatest crime of all. In response to Begin’s advocacy of armed resistance, the British government issued a reward for his capture, and he was forced to go into hiding. He remained hidden from 1944 through 1948. During this period, he assumed several false identities, including that of Rabbi Sassover, under whose alias he gave shiurim in shul to maintain this false identity. Begin continued to oversee the Irgun’s operations while in hiding. The Irgun heeded Begin’s call to arms, and a period of unrest settled across the land as these warriors targeted the British and symbols of its powerful empire in Eretz Yisroel. The most notable of these sabotage operations was the 1946 bombing of the King David hotel in Jerusalem. The British continued to implement a heavy-handed policy against these Jewish fighters, and Begin was outraged. These hostilities led to an event that Begin would later call the most difficult decision of his life. In response to the British execution of an Irgun fighter, Begin ordered the execution of two captured British sergeants. England was shocked, but never again did they execute another Jew in Eretz Yisroel. In 1948, when the British vacated Eretz Yisroel, the Arabs declared war, and Begin was finally able to emerge and lead his troops openly. However, Begin’s approach continued to displease members of the Haganah, whose leadership was responsible for declaring the new State of Israel. Because of these disagreements, Begin was not even invited to the Declaration of Independence ceremony. These disagreements nearly led to civil war between the newly created Israel Defense Force, which was comprised mostly of Haganah soldiers, and members of the Irgun. These tensions boiled over when the Alta Lena, a ship purchased by the Irgun, attempted to transport weapons into Eretz Yisroel for the newly created army. The ship was brought in without Begin’s knowledge, and when Begin appeared to greet the ship, Ben Gurion and other former Haganah leaders were incensed at what they believed was the Irgun’s efforts to undermine the authority of the newly created army. Ben Gurion’s men opened fire on the ship, but Begin ordered his men to stand down. As the bullets whizzed by, Begin fervently ordered his men not to return fire. In the thick of this confrontation, Begin was determined to see to it that Jews not shoot at other Jews. After the successful War of Independence, Begin formed a political party called Cherut. Although the left-wing Socialist parties dominated Israeli politics in those years, Begin voiced his opposition to matters he thought were contrary to Jewish ideals. When Israel was considering whether to receive German war reparations in 1951-1952, Begin led heated debates in the Knesset arguing that this was blood money and should not be accepted. More than once, he was escorted out of the Knesset for his vocal opposition. He argued that no amount of money could “repair” the crimes the German people committed against Am Yisroel during the Holocaust. Years later, in 1967, war with Egypt became inevitable when Egypt blockaded the Straits of Tiran to Israeli shipping. The mood in Israel was gloomy and tense, as everyone expected an Egyptian invasion that would result in thousands of deaths. The public was not confident with Prime Minister Levi Eshkol’s leadership, and in response, Begin undertook a diplomatic mission to visit Israel’s first Prime Minister David Ben-Gurion. Begin cast aside his personal opinions, and reached out to his former nemesis in a bid to convince Israel’s founding father to assume the leadership once more and quell the nation’s fears. Ben Gurion declined, but was impressed by the respect Begin showed him. Ben Gurion’s impression of Begin would forever be changed as a result of this gesture. Begin joined the unity government immediately before the Six Day War, and for the first time, he was a member of the Israeli cabinet. When Israel liberated the Temple Mount in the closing days of the war, it was Begin who suggested to Chief Rabbi Goren to blow the Shofar at the Kotel. Begin felt this was reminiscent of the Biblical conquest of Jericho, and this became a powerful image of Israel’s success in the reunification of the holy city of Jerusalem. Begin resigned from the cabinet a few years later, and considered retiring from politics and to focus on improving his health. Nevertheless, he decided to run for one more election in 1977, and the world was surprised with the results. Nobody expected Menachem Begin’s Likud party to win the election in 1977. His election was such a surprise, that it has become known in Israeli political history as the “Mahapach”, or the upheaval. It signaled a shift in Israeli politics that had been dominated for three decades by the secular left-wing parties. Begin was a new kind of Prime Minister, one with a conscious awareness that he represented the Jewish people. After the election results were announced, a reporter asked Begin what would be his first act as Prime Minister. Begin responded by removing a kippa from his pocket, placing it upon his head, and reciting the Shehechiyanu blessing. 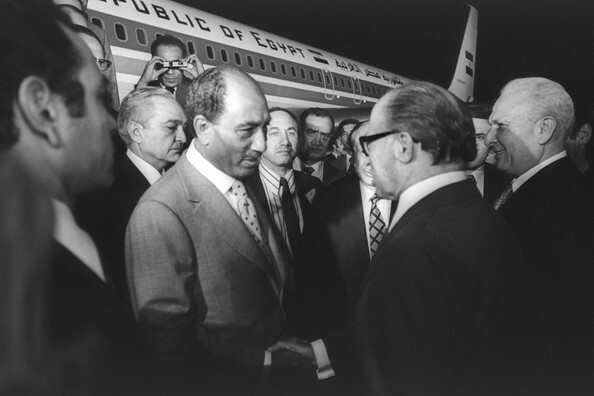 Shortly after Begin’s election, he invited Egyptian President Anwar Sadat to Jerusalem. This was the first time an Arab head of state visited Israel, and the goal of achieving peace between Israel and Egypt became more attainable. Following up from this historic visit, both Begin and Sadat were invited by President Carter to discuss peace at Camp David. Begin arrived in the United States in the summer of 1977. Before heading to Washington, he first sought the blessings of prominent rabbanim before he undertook the difficult task of negotiating with President Carter and Anwar Sadat. His first stop was at the headquarters of the Lubavitcher Rebbe, where he and the Rebbe had a private audience for several hours. The Rebbe and Begin shared a warm relationship, and Begin called the Rebbe “a great man in Israel.” Begin then visited Rav Moshe Feinstein at his lower east side apartment, as well as Rav Soloveitchik at the Waldorf Hotel. Begin and the Rav also maintained a warm relationship over the years, as the two shared a common Brisker heritage. The Camp David Accords, which were finalized in 1978, saw Israel give the Sinai to Egypt in response for recognition and peace. Many in Begin’s Likud party were disappointed that Begin acquiesced, and Begin himself voiced disappointment at what he saw was a lose-lose situation for Israel. He believed that returning the Sinai was a mistake militarily and economically, but was in Israel’s best political interests. For this sacrifice, Begin received the Nobel Peace Prize in 1978. When he accepted the Prize, Begin told the audience that it belonged to his people, Am Yisroel, not him. The Prize included a $1 million award, which Begin refused to accept. Begin’s first major military decision as Prime Minister was when he authorized the secret Israeli mission to bomb the Iraqi nuclear reactor in June 1981. Israel had intelligence that Saddam Hussein was developing a nuclear arsenal, and Hussein made it clear that he intended to wipe Israel off the map. Begin argued that when an enemy of the Jewish people espouses such hateful and violent sentiments, our history demands that we take him seriously. Former Ambassador Yehuda Avner relates that Begin paced his office reciting Tehillim during the mission, and only stopped when he was told that the pilots accomplished their mission and landed safely in Israel. Despite the outcry and Israel’s universal world condemnation, Begin proudly announced that Israel had nothing to apologize for, and the Jewish people would defend themselves by all possible means from any existential threats. 1982 saw Begin authorize another military mission, Operation Peace for the Galilee. Arab terrorists had been attacking northern Israel from Lebanon for months, and Begin authorized a limited invasion of Lebanon to eliminate the threat. This became known as the Lebanon War, and would eventually become a political liability for Begin. A tragic consequence caused by the fog of war was when Lebanese Christian soldiers, raided two Muslim refugee camps, known as Sabra and Shintilla. 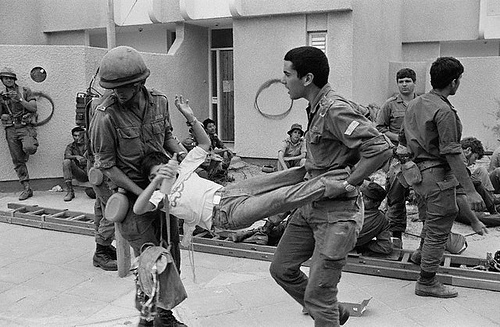 The world accused Israel and Defense Minister Ariel Sharon of war crimes for allowing this massacre to occur. Begin lamented to his aide that when goyim kill goyim, the world still blamed the Jews. Begin’s political strength began to fade in late 1982. His wife Aliza died in November, and he fell into a deep sadness. The Lebanon War was losing the public’s support, and it became apparent that Israel would remain in Lebanon for many long months, even after the terrorists had been expelled. Begin was in poor health, and he resigned as Prime Minister in late 1983. Begin spent the last decade of his life in seclusion. He left his apartment only to visit the grave of his wife Aliza, and for family celebrations. Although as Prime Minister, he was entitled to be buried on Mount Hertzl, he chose instead to be buried on Mount Olives, in a humble grave adjacent to his wife and two Lechi fighters who died in British captivity. 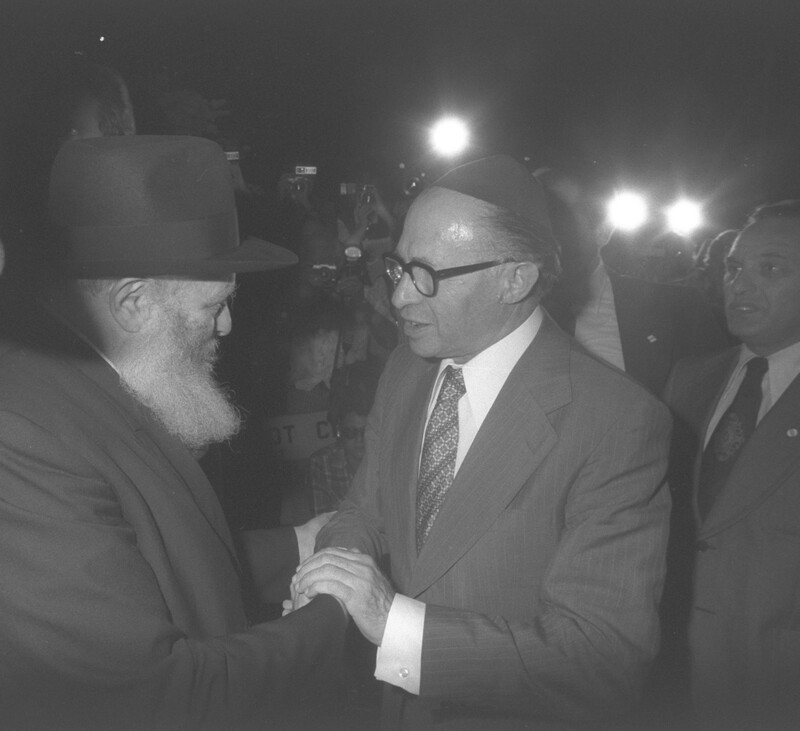 Menachem Begin died in 1992 at the age of 79, surrounded by his family. He reminded the Jewish people of its conscience and Biblical right to the Land of Israel. May his memory be a blessing. Sources: Menachem Begin: The Battle for Israel’s Soul, Daniel Gordis; Jewish Virtual Library; The Prime Ministers, Yehuda Avner.